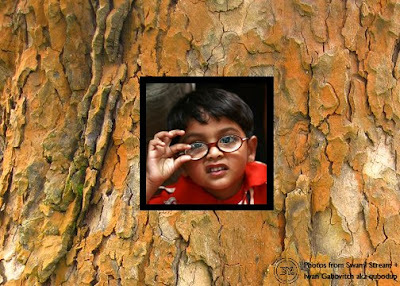 Recently, Maeryta Medrano sent me a link to an article about kids with ADHD and the impact of environment called "Nature Improves Concentration for Children with ADHD" written by Frances Kuo and Andrea Faber Taylor of the Landscape and Human Health Lab at Urbana-Champaign. 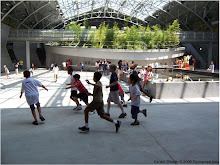 This article echoed something we'd been reading, writing, and doing our best to practice for a while- that natural materials and environments have an effect on kids. This is something I'll come back to in future posts. There has been a tradition in children's museums (especially) to create an environment with bright colors and plastic laminates. However, sometimes the use of these materials has an unintended effect on children. If we want to foster inquiry, reflection, and specific types of play, isn't it important that the colors and materials in that environment support those activities? Museums + LEED Fridays: Green Exhibits? On a basic level LEED is a way to quantifiably measure a building's performance in relation to the criteria set out by the USGBC. Buildings are LEED certified but not products, materials or people. This is not to say LEED has no bearing on exhibits. There are ways that exhibits can contribute towards points and the credit intents are a great way to inform a sustainable strategy for exhibits. they are not in and of themselves certified. This might seem nit picky but it actually brings up an important aspect of LEED. The system evaluates the entire project based on a set of criteria that is a bit complex and often times contradictory. This complexity within their system is necessary and good. As soon as you try to say something like "plyboo is a green material" things get complicated. It is a rapidly renewable resource but it also comes from China so it requires a great deal of energy to ship. At almost every turn you can find more questions than answers when trying to find something that is unequivocally "green". Instead of focusing on absolutes, LEED established a clear intent for each credit and then the sum of the credits gives an indication of the overall performance with regard to the environment. For instance LEED has a credit for using rapidly renewable resources for 2.5% of all the construction materials (plyboo applies here) and it also has a credit for using regional materials for 10% of construction materials. 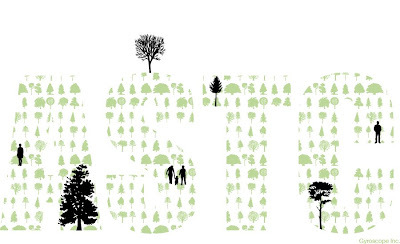 As the conversation about what make an exhibit "green" evolves, I hope it will broaden beyond material choices and focus overall sustainable strategies. As was raised in an earlier note, there are so many ways to look at this issue. Focusing on the entire life cycle of an exhibit will give you a different set of criteria (and thus end result) than if you were focused on carbon footprint. How do we establish this criteria and then what does it say about us? What are we willing to overlook, what tradeoffs are we willing to make? So far the discussion has focused on the built object, but there is also the content of an environmentally focused exhibit to think about and how to engage the visitor in these issues. The social space of the museum could also offer unique ways for visitors to experience the aggregated impact of their decisions and sense community that can come from acting collectively. Name Games at Children's Museums? Take the Survey! Hi- Terah Gonzalez, Administrative Assistant and Justine Roberts, Principal at Gyroscope guest posting. We're working on a project that explores a unique trend in the naming of children’s museums. 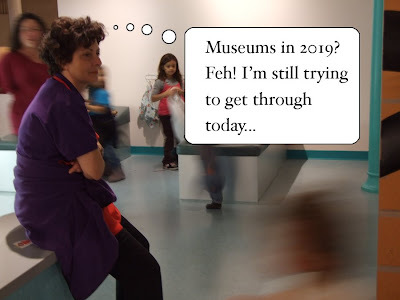 From analyzing data from the Association of Children’s Museums (ACM), we have found that more than 12% of registered ACM museum members have changed their name in the last 16 years. Interestingly, over half of the same set has changed their name in the last 5 years. Many of these children’s museums have changed around the order of words in their names– Children’s Museum, Boston to Boston Children’s Museum, e.g. Many others have gone from this type of name to one that includes active verbs or fun adjectives such as Explora (which used to be the Children’s Museum of Albequerque) and Imaginarium of South Texas (which originally opened as the Laredo Children’s Museum). In all, of the 300 museums in the ACM membership, 52 have this style of name and 11 of these organizations have adopted this type of name in the last five years (that's 21%). This discovery brings up several questions about the names of children’s museums. Why are museums changing them in the first place? What is it about the last five years that has seen so many name changes? Why are children's museums increasingly choosing names that are “off the beaten path” and include verbs and adjectives? Are these museum names sign of other deeper changes? Or are museums seeing their names as essentially marketing and positioning opportunities? To answer these questions and more, Gyroscope has launched a survey of Children’s Museum professionals. It focuses on names, audience, and models for visitor interaction, visitor feedback, and visitor research in children’s museums. If you would like your organization to be included in the survey, please click on the link below. For the past few days I've been contributing to a future-casting "game" called Superstruct (apologies for those who are already in the know). It's a make-believe, online game where you are asked to think about the world in 2019. This is done by posting on the game's wikis and blogs while pretending that it really is 2019. Why, you ask? Because it's a powerful way to try ideas on for size. This is especially intriguing to me against the backdrop of some of the posts I've written, and some of the projects we've had in our office. One idea we foster (in the present) with our clients is actively and sometimes pervasively engaging with the community. This can be done through programs, media, location- the list goes on. In addition, there are numerous papers, blogs, and books outlining the benefits of this approach. As I think about how it might play out moving 10 years ahead, community engagement begins to make a lot of sense. For example, take the satellite or "Science Spot" idea that Gyroscope (with others) proposed for the Buffalo Museum of Science. That's where a large museum has outposts in the community that offer limited collections but extensive programming. 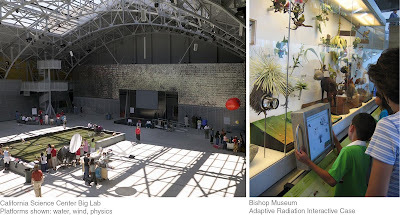 If in the future energy resources make it impossible to house large exhibits, the cost of travel skyrockets, and global illnesses becomes real (they are pretty dark about 2019)-- then having smaller satellite museums start to look like a sustainable model. Building upon this idea of a local museum, I add to it the prevalence of "Crowd Curating" and instant communication/sharing we see today. In this future where user feedback is the norm, distributed yet personal experiences could create a realm of content that sits atop or alongside the object/exhibit+wall text paradigm. This is all done in a community or local context, which has the added benefit of creating affinity groups for an institution or place. 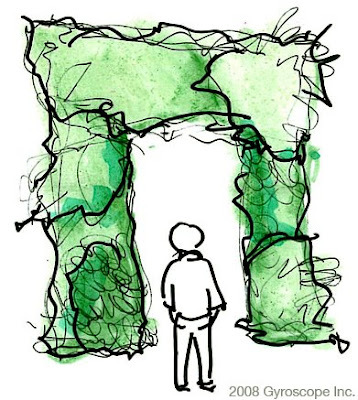 That begins to look like a place where it's easier for people to be invested in, and thus, will be more passionate about contributing to and preserving it. I know, I know. You're thinking I'm a Pollyanna. There are weeks to go in the game, so I'll report back and let you know if things are still looking so optimistic. 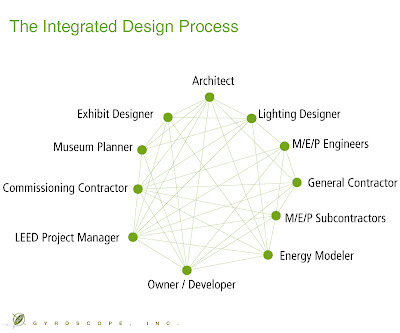 "Developed a green exhibit certification process like the LEED certification for buildilngs and we are applying it to our exhibit design and fabrication." ...and of course Museums Now posts on LEED and Museums on Fridays. I went to a few web-related sessions at ASTC that brought up some interesting questions and case studies. Bryan Kennedy of the blog Science Buzz talked about the Body World Exhibit blog at Science Museum of Minnesota (SMM). They used the opportunity of the show to look at issues around body donation and asked questions of ethics (and beyond) via the blog. In using this example where they opened it up to be "messy", Bryan was trying to get the audience to consider what their comfort level is with things like controversy when setting up a 2.0 outreach tool. Kevin Von Appen of RedShiftNow posed the question of "How do you make the virtual audience physical?" He gave a case study of a world wide YouTube event and subsequent real world "888torontomeetup" they held at Ontario Science Center, and how popular it was. While they didn't end up covering a lot of science, it brought in a new audience to their museum, and created a memorable (and heavily archived) connection. Nina Simon of Museum2.0 gave a really fun example about how to do "tagging" in the real world. It's about a book drop in the Netherlands where folks returned books into one of two slots: average books and great books. She wrote a fantastic blog post about designing from a virtual metaphor to a real world experience. In terms of child safety and museum sites, they suggested that you don't ask "problem questions" of kids during the log in to avoid issues such as COPPA conflicts later. On extending the visit: the Franklin Institute (I think) has a face aging interactive on the museum floor that posts the picture on the web site. 75% of visitors log in from home to retrieve it. What a great opportunity for them to ask provocative questions about their thoughts on aging, plastic surgery, you name it. You could enrich AND extend the museum experience. In the session Making Exhibitions Memorable that I cartooned about yesterday, Renato Valdes Olmos discussed how exhibits have permanence, but little reach outside the museum walls. He reinforced the importance of following those who are blogging or flickring about your exhibits, because again, that extends their reach, and leaves a record. He brought up the artist Banksy, who made a fictitious pet store exhibit and how word spread in a viral fashion via Twitter- which got people to go find it. That approach might not play out so easily for a science museum with a permanent collection-- the Banksy piece is a temporary art exhibit. The thing I keep hearing is this: provide multiple vehicles for visitors to comment and spread the word about their experiences at your museum. Listen to what they are saying, and respond. The interaction itself will provide great fodder for expanding your relationship with your visitors, and in turn, your impact on their lives. For me, this boils down to being open, hospitable, and responsive-- and utilizing web 2.0 to do it. This will be a longer post in future weeks. Here's a little teaser to whet your memorable exhibition appetite: FYI, the exhibit cited here is "Race: Are We So Different?" from Science Museum of Minnesota. Just a quick hit on a very informative session about Science Cafes: how to start them, run them, and why your museum needs them. What are they, you ask? I will post a complete download on this session in the coming days. For more information, go to the Science Cafes web site through the Nova/Science Now program. There are some excellent resources and PDF guide you can download. Start one today! Thanks to gailf548 for the pub shot, and Mark Glusker for the calculating machine. 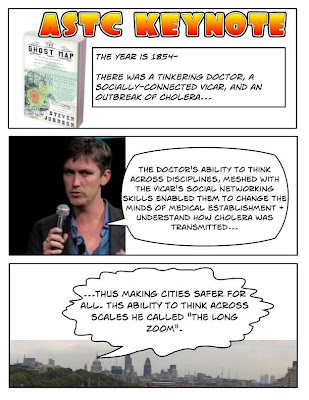 Steven Johnson on "The Ghost Map"
Here's the Comic Life version of today's keynote: For more on the book, go to The Ghost Map. This week I'm at ASTC (Association for Science and Technology Centers). I'll post some quick hits about what I'm learning and hearing about here. It's in the lovely city of Philly, and so far, there have been some good sessions. 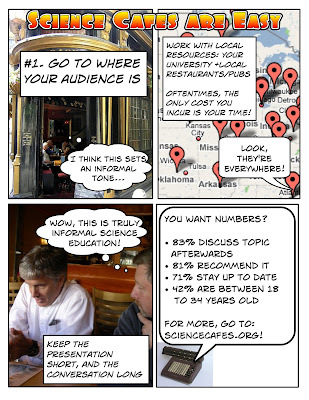 I'm hoping to experiment with a new way of presenting the info via Comic Life. Just found out about it (probably the last person on earth) and I'm looking forward to using it. You can let me know how effective (or not!) it is. "The commissioning process is a quality control process that involves the owner, users, occupants, operations and maintenance staff, design professionals and contractors." Definition of the audience. Who will come, and how many? Demographics. Definition of the program. Why will they come? Exhibits, education, theaters, outreach, web. 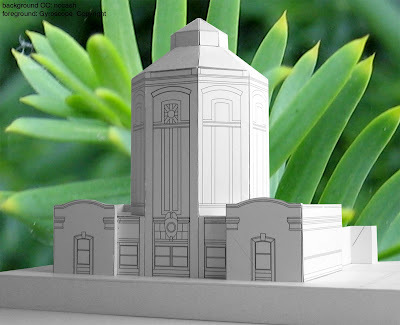 Architectural concept and site. Where will they come? How can the building reflect and support the mission and program? The business model. How will the museum support itself? Earned income, support, philanthropy, endowment... What is the relationship between the business model and the service model (item #2 above)? The capital budget. What's it all going to cost to put the plan in place? "Now as to whether it is a GREAT master plan—guess that would depend on doing all of the above well, but also doing them all together. Each feeds back on the other. The program affects the staff plan and operating budget; the capital budget influences the architecture and exhibits; the audience affects and is affected by the program and the business model. And so on. The most common mistake is to treat each topic as more or less discrete, for example by trying to estimate attendance before studying what kind of museum and what type of program. So the plan needs to be holistic and address everything at once. And do it with substance, style, careful research, and creativity." Exhibit or Exhibit Platform: which is right for your museum? What is an "exhibit platform" you ask? That's when an institution has an infrastructure that has been designed to support rich and changing experiences, programs, or activities. So, when is it appropriate to use "exhibits" and when "exhibit platforms"? I’ll demonstrate: In 2002, Gyroscope teamed up with the staff at the California Science Center to develop the Amgen Center for Science Learning (otherwise known as the Big Lab, pictured above left). This beautiful armory was refurbished to serve a nearby school. At that time, we were in the design development phase of the Bishop Museum Science Adventure Center- an addition to their natural history institution. In the case of the Big Lab, there was a school group that was coming on a daily basis. So one-hit wonders (even if they were working with phenomena) were not going to sustain the learning experience. The teachers and students needed an inter-changeable system that they could plug and play different lessons and activities into. This became an "Exhibit Platform" approach (think set design, to an extent). The Bishop has an amazing collection, and needed to serve a large audience of Hawaiians and global tourists. As a result, they had very different operating requirements from CSC. This global audience is often a one-time visitor, with school groups coming on occasion. While they were describing what was unique to their "local" environment, it is so diverse and well-known, that it was well-suited for high impact exhibits. In addition, the Bishop needed more permanent exhibits because it was going to be a long time before they would have funding again to renovate. Keep in mind from start to finish, the Science Adventure Center took 15 years! Traditional exhibits can be spectacular, iconic, and memorable experiences. They can also be expensive, complex, and as a result, permanent. In this quest for museums to compete for positioning to be the "3rd Place", total exhibit permanence is not always the appropriate solution. The exhibit platform model is useful for zones in a large institution with a need for changing programming or community museums where exhibit maintenance funding is limited, there is a good facilitation staff, and most importantly, repeat visitors. It's a great approach for flexible learning and play. Other museums where we have had success with this approach includes the Chicago Children’s Museum Skyline Exhibit, which I’ll talk about in a future posting. Up next: what makes a great master plan? Hi, Scott Moulton again. As I eluded to in my previous post on LEED, the mere decision to follow the path towards certifying your building will shape the process dramatically. In order to meet the design challenges posed by LEED, document the credits and then verify the completion it will require a highly collaborative and integrated approach to the project. The diagram above is an attempt to illustrate the way that the disciplines will all be working together. In the initial phases of a strategic plan we talk about the need to start with everything and this applies to the LEED process as well. There are so many interconnected interests and agendas that will only work when they work together. One example of this was when working on the Leonardo we had an initial LEED design charette and the mechanical engineer (a brilliantly creative guy) suggested using a cooling tower which would work to lower energy costs, serve as a way of interpreting the sustainable strategies in the building and offer a naming opportunity to a donor who was dedicated to sustainability. This type of thinking ties together Public relations, fund raising, mechanical engineering, exhibit design, and just about everyone else on the design team. 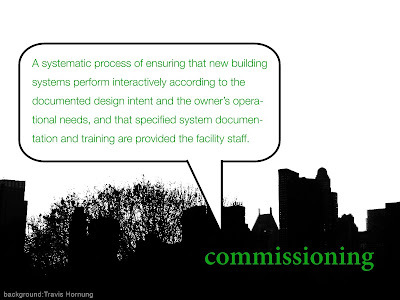 Another interesting aspect of LEED is that they require you to go through a commissioning process. I'll be explaining that and how it will affect your project in a future post. Quick follow-up to "Term Limits"
Here's something I forgot to mention in my earlier post- the Milwaukee Art Museum has a new exhibit opening this month called Act/React: Interactive Art. It shows work by a lot of the current big hitters in that realm (Liz Phillips, Daniel Rozin, Scott Snibbe, Camille Utterback). This exhibit plays with what I think are the more traditional notions of "interactive". I love the fact that there are many shades of grey around what is an exhibit as well as what makes it interactive. That's keeping it alive and compelling. It also spans science, art, and design to name a few. It's the shared language that needs some reconsideration. I'm curious about what's worked for you. 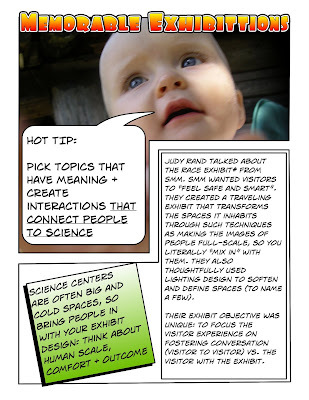 What kinds of terms have resonated with you when working with these ideas? What tends to help a shared development process move forward when talking about something ubiquitous and yet unique? I am a passionate believer in the power of community. Small, large, microcosm- it doesn't matter. So I get pretty excited when I hear about projects such as the Denver Community Museum ("Present Day Artifacts Made by the People for the People"). Thanks to Brent Carmack of the Fort Collins Museum for bringing this to my attention. 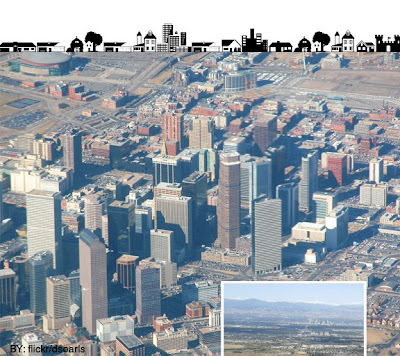 From their site: "The Denver Community Museum is a temporary museum located in Denver, Colorado. Carried out in the form of a pop-up gallery, the museum will exist for less than one year - an institution with an expiration date. Contents for the Museum's monthly, rotating exhibitions are based entirely on community submissions. The Denver Community Museum is a not-for-profit project, which is free and open to the public." Basically, they put out a call for entries... to the neighborhood. Such as "Mummify something you would like to preserve - any shape/size, using any materials you desire. Share any relevant mummy stories, facts, accoutrements or charms for display." They accompany it with a photo suggestion, and then put on a show at the end of the month of submissions. Here are some of the things I love about this idea: - their identity is specifically in line with the community: it's about them, literally - they have created a ritual around the exhibits changing on a monthly basis - they have also created a sense of anticipation + surprise - each new exhibit will reveal something about the people around you - it's temporary - it's free Here's what I'm not so excited about: - it's temporary - it's free Founder Jaime Kopke was quoted as saying: “The idea is to create a community archive that is both accessible and relevant to Denver residents... The fact that the DCM is a limited time only engagement adds a level of excitement that you may not normally experience in a museum.” I love that someone wanted to make a museum that was purely reflective of and relevant to its community... but why does it have to be temporary? Shouldn't finding new ways to engage your public be a persistent curatorial goal? Is it the deadline that forces public and staff alike to stay on schedule and focused? How might other institutions adopt this deadline strategy? Who says we can't be exciting?!? Also, free is nice, really, but these days, not so sustainable (and I don't mean in the enviro sense). What about sliding scale admission? I think the Met uses this approach. Enough quibbling- this is a great idea, and I hope many local museums take notice. I know larger institutions have grappled with community engagement, but the intimate scale works too. It's just more... neighborly. This brings me to a point which I'll be writing about soon-- that is small + nimble institutions are perfectly suited to maximize on community engagement AND web 2.0 technologies. PS: I hope to visit in December, but if you have any photos to share, let me know. 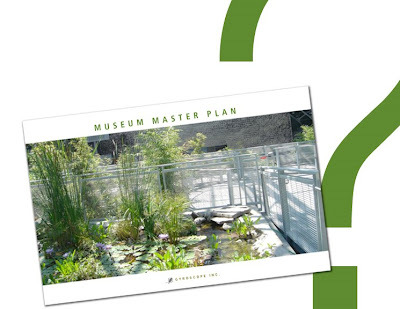 We've decided to make our posts from Scott Moulton on LEED and Museums a weekly event. So check back on Fridays to see the latest info! You can reach us at Gyroscope Inc., or via mail: maeryta [@] gyroscopeinc [.] com.